← Silent Triangular Object With Greenish Blue Lights & Red Center Light. Video Clip Large Star-Like Object. 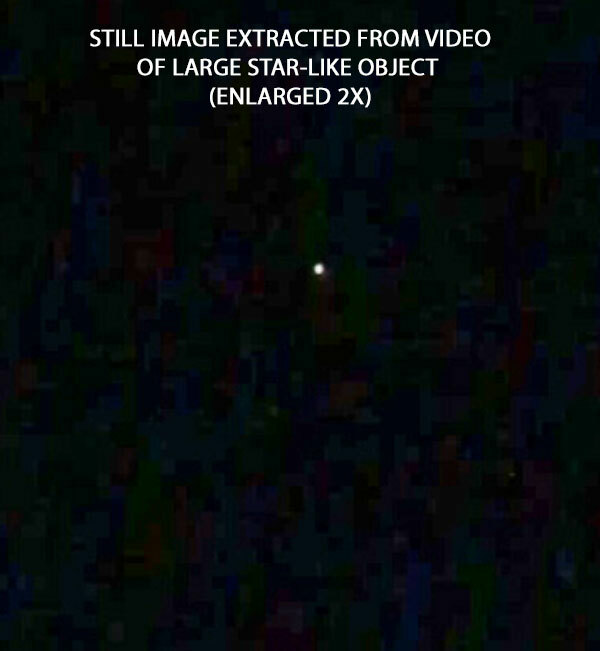 STILL IMAGE OF LARGE STAR-LIKE OBJECT EXTRACTED FROM VIDEO. Description: My sister and I were driving today Jan 28, 2019 in Carnation, WA around 6:00 PM. It was a clear sky and we happened to see this strange object moving slow. It made no sound and had no blinking lights. At first we thought it was a satellite, but it was too low and too large. It looked like a big Star moving across the sky and then disappeared. I’m curious to know what you think this could be. Note: A check of the Heavens Above satellite database shows that the International Space Station was visible at the location and at the time of the sighting. I believe that this is what the witnesses saw. This entry was posted in bright light, Orb-like craft, Orb(s) of Light, Photos, Possible Satellite, silent, Star-like, UFO Sightings 2019, UFO Sightings Washington, Video Clips and tagged Low flying, Slow movement. Bookmark the permalink. 2 Responses to Silent Large Star-Like Moves Across Sky, Vanishes. It looks like a fire lantern. People often buy these online and then use them for special events. I am reasonably sure that the object is the Space Station.